Goldstrike Resources Ltd. is pleased to report that Phase 1 trenching of bedrock on its Lucky Strike property, located in the heart of Yukon's White Gold District, has returned values of 0.42 grams per tonne gold over 154 metres, including 0.76 grams per tonne gold over 78 metres, including 3 grams per tonne gold over 8 metres. These results are from the new Monte Carlo discovery zone, which measures 1,400 by 350 metres and remains open, making it the largest known new gold in soil anomaly in the District. The Monte Carlo zone is one of four large gold in soil anomalies discovered at Lucky Strike. The others include the Belmont zone, measuring 600 by 300 metres, the Samson zone, measuring 600 by 300 metres, and the Boss zone, measuring 1,000 by 1,000 metres. All are located along a 9 kilometre northwest gold trend that remains open. Other significant results from Phase 1 trenching at Monte Carlo include 0.21 grams per tonne gold over 28 metres in Trench 7, and 0.58 grams per tonne gold over 58 metres, including 2.73 grams per tonne gold, 5 grams per tonne gold over 6 metres in Trench 8, and Trench 9 assayed 5.15 grams per tonne gold over 6.8 metres. This initial trenching confirms that Lucky Strike has strong potential for a near-surface gold deposit similar to the Goldcorp/Kaminak Coffee Creek deposit (total resource more than 5 million ounces) and Kinross's Golden Saddle deposit (total resource more than 1.5 million ounces). The new Monte Carlo zone is delineated by a 1400 by 350 metre gold in soil geochemical anomaly with soil values ranging from below detection level to over 1.9 grams per tonne gold, and is also characterized by elevated values of silver, tellurium, molybdenum, and copper. The Monte Carlo soil anomaly coincides with a strong northwest-trending geophysical anomaly. Six excavator trenches from Phase 1 at Monte Carlo have exposed gold-bearing mineralized quartz veins and orthogneiss over a consistent strike length of 350 metres, and the zone remains open in all directions. All trenches were sampled at two metre intervals where possible, and all intersected significant gold mineralization (see table of mineralized intervals and trench map below). Four large gold geochemical anomalies discovered over a 9 kilometre strike length. All are wide open for expansion and future drilling. Large scale drill program currently being planned. Total trenching at Lucky Strike in 2016: 476.8 metres. Phase 2 trenching and geophysics is underway in preparation for drilling. Property covers current and past-producing placer gold creeks. Contiguous with Kinross Golden Saddle property. Grab sample from Boss zone assayed 41.7 grams per tonne gold. Visible gold observed in rock at Samson zone. Samson zone 2016 trenching returned 0.32 grams per tonne gold over 12 metres, including 0.41 grams per tonne gold over 6 metres, remains open. Up to 1.9 grams per tonne gold in soil at Monte Carlo. The Lucky Strike property is 100% controlled, over 100 square kilometres in size. The property has never been drilled, and has excellent potential to host near surface gold deposits. Over 70% of the property remains unexplored. The Lucky Strike property is considered by the Company's geological team to be analogous to both the 5 million ounce Goldcorp/Kaminak Coffee Creek deposit, located 26 kilometres to the southwest, and the Kinross 1.5 million ounce Golden Saddle deposit, located 15 kilometres to the west. Similarities include geochemistry, geology, trend and grade of mineralization. Kaminak has reported that all discoveries at Coffee Creek were made by drilling directly under gold-in-soil anomalies, and that drilling soil anomalies had a 90% success rate. The mineralization at Lucky Strike is hosted in highly weathered and oxidized units of quartz veined, silicified and carbonate-altered orthogneiss with panels of intermediate to mafic amphibolite. The mineralization occurs along a shear zone that is interpreted to be a thrust fault. This is a similar setting to the Golden Saddle deposit, where the discovery trench returned a gold grade of 1 gram per tonne gold over 40 metres, and the discovery hole returned 4.35 grams per tonne gold over 18 metres. The grades are also similar to those at Coffee Creek, which Goldcorp recently purchased from Kaminak for $520 million. One of Kaminak's 2009 original discovery trenches at Coffee Creek (Trench 4) showed that the longest interval of gold mineralization in the Supremo zone returned 0.4 grams per tonne gold over 100 metres, compared to Goldstrike's 2016 discovery trench at Monte Carlo that returned 0.42 grams per tonne gold over 154 metres. The results seen at the Monte Carlo trenches are similar to those seen in the initial discovery trenches at both Coffee Creek and Golden Saddle deposits. A Phase 2 trenching, soil sampling and geophysical survey program is currently under way at Lucky Strike. 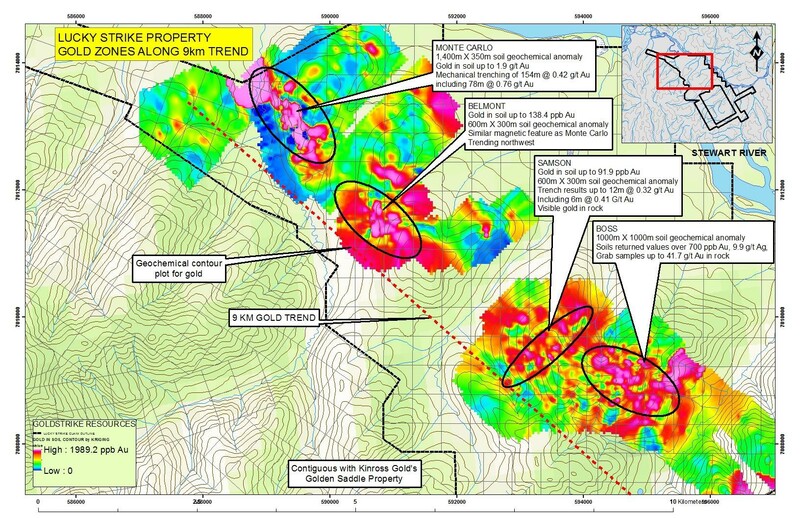 Trenching is focused on extending the strike length of the Monte Carlo discovery zone as well as testing other strong gold-in-soil anomalies at the Belmont zone, which is located 1.1 kilometres on strike to the southeast. Multiple soil grids are also planned in future to expand and delineate the full extent of other anomalies along the underexplored 9 kilometre Lucky Strike trend, including the Samson zone, 3 kilometres on strike to the southeast, and the Boss zone, 6 kilometres on strike to the southeast, all of which remain open. An induced polarity survey is under way to outline the mineralization in the Monte Carlo zone at depth and to identify additional drill targets for the planned drill program. Commercial barge landing and airstrip nearby. Proposed haul road for Goldcorp's Coffee Creek deposit crosses the Lucky Strike property in two locations. 90 kilometres south of Dawson City and international airport. Adjacent to Yukon River, excellent river access. Property has a permitted airstrip within the claim boundary. "The new Monte Carlo zone discovery and the confirmation of a 9 kilometre long gold trend are strong indications that the Lucky Strike property has strong potential to host several near-surface gold deposits," said Goldstrike Director Trevor Bremner. "The property is close to both the Coffee Creek deposit Golden Saddle deposits, and has excellent access. We look forward to drilling all of the zones that have been outlined by trenching and soil geochemistry, which has proven to be an excellent guide for identifying shallow gold mineralization in this terrain. Based on the results of this program, a large scale drilling and exploration program is warranted to realize the full potential of this underexplored property. We would like to thank the entire team for their dedication, and the Yukon government for their financial support of the successive exploration programs that led to this discovery. Goldstrike looks forward to releasing the results from its Phase 2 Lucky Strike program when they become available. Additional results from its flagship Plateau property are expected to be released in the immediate future." A total of 24 rock grab samples, 24 rock trench samples, and 926 soil samples were taken on the Lucky Strike property inPhase 1 of the 2016 program. Rock grab samples ranged from below detection limit to 2.046 grams per tonne gold. Rock trench samples ranged from below detection limit to 15.5 grams per tonne gold. Soil samples ranged from below detection limit to 269.8 parts per billion gold. There are no sample assays outstanding. Note: Grab samples are selective by nature, and are unlikely to represent average grades on the property. Sample analysis and assaying for all of Goldstrike's projects have been conducted by Bureau Veritas Mineral Laboratories Canada (formerly Acme Analytical Laboratories Ltd) in Vancouver, BC, which is ISO 9001 accredited. Soil samples are dried at 60C, and 100 grams are sieved to -80 mesh. A 15 gram sample split is then leached in aqua regia at 95 degrees C, and analyzed by a 36-element ICP package that includes semi-quantitative gold. Rock and drill core samples are crushed to 80% -10 mesh, and a 500 gram sample split is pulverized to 85% -200 mesh. 50 gram charges are then assayed for gold using fire assay fusion and ICP-ES finish with a lower detection limit of 2 ppb, and an upper detection limit of 10 ppm Au. In addition, 0.5 mg charges are digested by modified 1:1:1 aqua regia (HCl-HNO3-H20) and analyzed by 36-element ICP-MS that also includes semi-quantitative gold with a lower detection limit of 0.5 ppb Au and an upper detection limit of 100 ppm Au. Rigorous procedures are in place regarding sample collection, chain of custody and data entry. Certified assay standards, duplicate samples and blanks are routinely inserted into the sample stream to ensure integrity of the assay process.